Bob Corlett reveals how and why managers duck risk in the hiring process. Is there an upside? Read more in this week’s feature, Shifting Blame and Ducking Risk in Hiring. Heather Bussing explains the ins–and–outs of how data collected at work becomes evidence when things end up in court. It’s important to remember, It’s not just information, it’s evidence. On Episode 43 of HR Tech Weekly Stacey Harris and John Sumser debrief The 18th Annual HR Tech event. In Episode 121 of HR Examiner Radio, John Sumser speaks with Doug Shaw, a leadership and HR consultant, facilitator, artist, and the Founder of What Goes Around. Hiring is the single riskiest responsibility for most managers. Like the Kobayashi Maru, hiring appears to be a no–win scenario – the perfect storm of problematic job responsibilities. It’s a long way from product launch to achieving scale. Making any serious Enterprise Software viable is like seasoning a cast iron skillet. Usage makes it better. 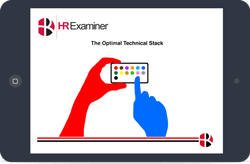 John and Stacey debrief this year’s HR Tech event in Las Vegas, including the Sierra–Cedar 2015–2016 HR Systems Survey, Namely, Jibe’s win at the HR Tech Hackathon, Greenhouse.io, PeopleSoft, CivilSoft, ADP, SAP, and more. John Sumser talks with Doug Shaw, a leadership and HR consultant, facilitator, artist, and the Founder of What Goes Around. Dwane Lay, VP Customer Experience, Dovetail Software. HR Tech Weekly Episode 43 with Stacey Harris and John Sumser.